The Parthenon in Athens has seen the depredations of war, vandalism, pollution, and well-meaning antiquarians, but it has always been the city's most prominent sight. Elsewhere in the Greek world are temples to rival it that were truly forgotten, isolated from many of the ravages that visited their Athenian counterpart. Fifty miles south of Naples, on the western Italian coast, lie the ruins of the ancient Greek colony of Poseidonia, now known by its Roman name, Paestum. The walled city claims not one but three remarkably intact Greek temples that had been abandoned and ignored—surrounded by a fetid, pestilential, and protective swamp—from medieval times until their "rediscovery" by archaeolgists, historians, and architects in the eighteenth century. They "constitute the best-preserved 'population' of temples of any Greek city, save possibly Athens," says retired Brown University archaeologist R. Ross Holloway. Paestum is perhaps one of the most unjustly overlooked sites of the ancient Mediterranean world. Recent excavations and conservation have revealed new portions of the Roman city, providing a more complete picture of a unique classical town. According to ancient accounts, Poseidonia was founded by exiles from either the nearby, prosperous colony of Sybaris or the Greek city of Troizen around 600 B.C. It was a successful trading post for the Magna Graecia, or the network of Greek colonies that sprouted up in Italy and Sicily starting in the eighth century B.C. The city's three surviving temples, two dedicated to Zeus' wife Hera and one to Athena, were built in the sixth and fifth centuries B.C. However, around 400 B.C., the city was overrun by people from the Italian interior called the Lucanians. Though some sources claim the Lucanians enslaved the Greeks, their "conquest" was more likely an act of cultural fusion. Lucanian rule over the city ended in 237 B.C. with the arrival of the Romans. While the Romans kept the temples intact, they all but razed the original Greek city, building their own on top of it. A prosperous Greek colony became a marginal Roman one as overland trade routes shifted away from the city in the second century B.C. "Paestans led lives unencumbered by great possessions in a city declining in importance and becoming a bit of a backwater," writes University of Michigan professor emeritus John Griffiths Pedley in his book on the site. Small communities persisted near the Temple of Athena for a few centuries—it was converted to a basilica around the fifth century A.D.—as nearby springs silted up, turning the area into swamp. And with that, Paestum was entirely abandoned: a place of hostile locals, malarial mosquitoes, and lurking brigands. It was not until the excitement surrounding the discovery of Pompeii and Herculaneum in the mid-eighteenth century that scholars "rediscovered" the city. Several of these visitors wondered how a site so impressive could go unappreciated for so long. With their careful alignments and pleasing proportions, the temples sparked a reexamination of ancient architecture that culminated in one of the great architectural debates of the eighteenth century: were Greek temples of the Doric order like these—massive but light on ornamentation—somehow primitive compared with the more ornamented Roman ideal? 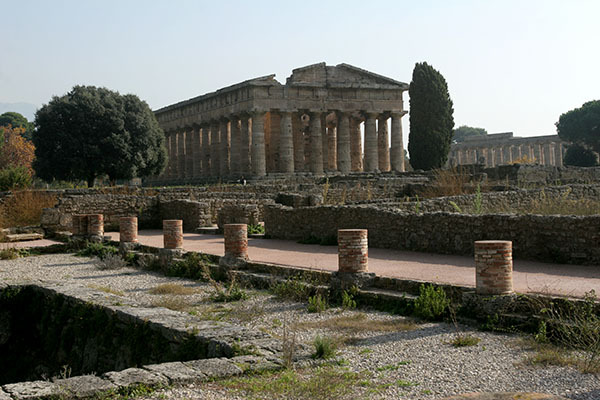 Using the Paestum temples as evidence, German theorist Johann Joachim Winckelmann posited that later Roman architecture grew from the Greek style. These temples were not primitive, but foundational. He placed Paestum at a pivotal moment in the development of classical architecture, and soon even scholars most resistant to the idea would come to agree with him. The three temples of Paestum loom large over the rest of the city, both physically and in the architectural imagination, but the city itself also has much to offer visitors. Refurbished areas provide access to a warren of shops and other buildings, and much more still lies under private land in every direction. Each visit brings a chance to discover Paestum anew. To read more about the classical world, click here to buy a copy of our special issue.